Double Bass Drumming later became an integral part of Heavy Metal, as pioneered by the likes of Carmine Appice, Ian Paice, Cozy Powell, Phil Taylor and Tommy Aldridge. 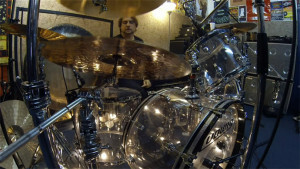 American Thrash Metal band Slayer’s drummer Dave Lombardo was named “the godfather of double bass” by the magazine Drummer World. The hard rocking, glamorous Metal bands of the ’80s often featured well-designed, flashy double-bass drum kits on stage, but certainly more bands had them than played them. And though Hard Rock music was not the only popular music, it was the style most likely, outside the waning camps of Prog-Rockers, to include double bass drumming. Drummers that took it beyond solos and big endings include the ever-present, ever-exciting Tommy Aldridge, Gregg Bissonette, Aynsley Dunbar, Tommy Lee, Lars Ulrich and Alex Van Halen. The well-coifed Rock bands of the ’80s took the pendulum so far that a backlash was inevitable, and Grunge was born. This next generation of rockers were influenced both by Punk Rock — clearly not a haven for double bass drumming – and the joy of Marshall stacks. But even during this era, Hard Rock mutated into a style that was very friendly to double bass drum users. Whether Speed Metal, Thrash Metal, Death Metal or Black Metal – it all was played hard and fast, loud and crunchy, by young men full of ideas. Band like Anthrax, Metallica, Megadeth and others layered guitar riffs over double bass licks, but nobody on the Speed Metal scene would have as much influence as Dave Lombardo did with Slayer. Slayer re-wrote the book of Dark Rock that Black Sabbath penned so perfectly back in 1970. Sabbath played slow, sludgy tempos, and drummer Bill Ward hardly played many double bass beats in songs. But Slayer’s 1986 release Reign In Blood, which continues to be mentioned as a favorite and an influence by notable drummers, features both machine gun double bass and speedy tempos. Lombardo, with his fleet feet and his ridiculous endurance, emerged as the poster boy for a new direction in double bass drumming. Slayer was crowned the princes of this new style of Metal : faster, darker and heavier.